Brand Endless Int’l is proud to announce the debut of Zeal Function coilovers for the GRB Impreza. The full line-up of Function coilovers are available including the Super Function race series as well as the new Function-A and Function-T models which debuted at Tokyo Auto Salon this year. Find out more at Endless USA. The Zeal Function series coilovers for the GRB Impreza will feature an inverted monotube design for the front, utilizing camber adjustable pillow ball upper mounts, and a non-inverted rear with aluminum rigid upper mounts. The new Function-A and T models are highly customizable, allowing the end user to choose damper adjustability, type of upper mounts and type of spring. All current Zeal coilovers use an independent lower bracket for adjusting ride height as well as an independent adjustable spring perch for spring preload settings. 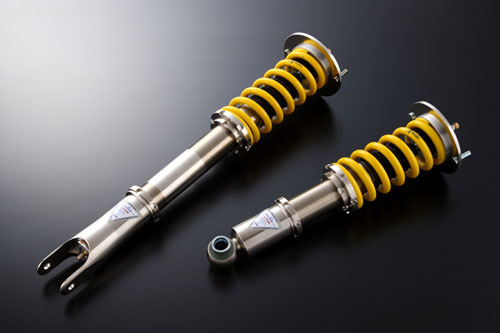 All coilovers also feature a finish highly resistant to rust and come with a one year limited warranty. Brand Endless Int’l is also proud to offer full overhaul capabilities in-house at their facilities in Huntington Beach, CA. Custom spring rates available at no extra charge.